The internet hivemind has claimed another victim. 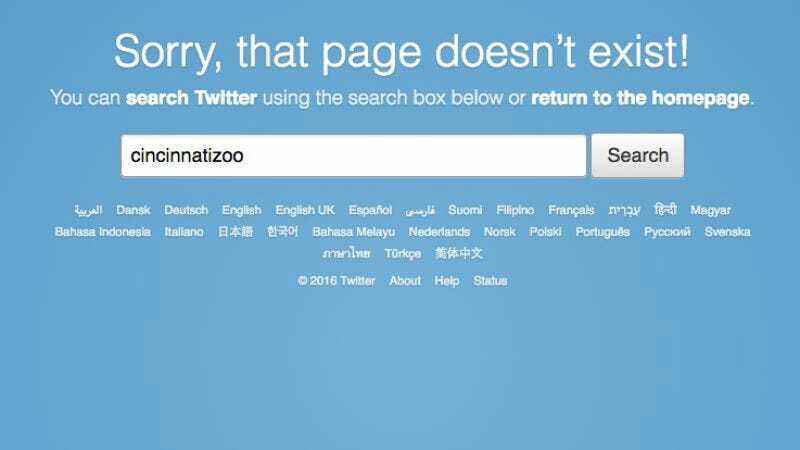 The Cincinnati Zoo deleted its Twitter account after saying yesterday that it was being constantly barraged with Harambe memes. While the zoo hasn’t come out with an explicit statement about what caused its Twitter shutdown, the cause and effect seems fairly obvious, especially when perusing the tens of thousands of Harambe-inspired “jokes” the zoo gets thrown at it every single day. The incredibly repetitive bullying has been stressful for the zoo’s staff, something the zoo’s director, Thane Maynard, reiterated yesterday when he said the staff was having trouble “healing” and moving on in the wake of the gorilla’s death thanks mostly to a bunch of Twitter-based knuckleheads. Maynard’s personal Twitter account was hacked over the weekend, with the hacker posting tweets using the hashtags #DicksOutForHarambe and #JusticeForHarambe. The hacker, who could potentially face legal sanctions under the Federal Computer Fraud And Abuse Act, also posted, “I was planning this for a while, so sorry it took so long brother! Have a good time in Heaven. #Harambe.” Maynard has since taken back control of his account— although, like the Cincinnati Zoo’s page, it appears to have been taken down since Monday. The Cincinnati Zoo is asking Harambe fans to consider donating to or working toward gorilla conservation rather than posting dumb jokes on the internet. Let this be a sacrifice we’re all willing to make.